Father’s Day is a time to shower your husband, son or other guy in your life with love and gratitude. But let’s be real: The best way to their heart is likely through their stomach! Morton’s The Steakhouse: If the special guy in your life is a carnivore, he’ll love this upscale steakhouse. Located about 1.5 miles from your Canvas Valley Forge apartment, Morton’s is known for its prime-aged beef, but even non-meat lovers can get suited on its diverse menu. With tableside presentations and an open-concept kitchen that allows diners to see the award-winning chefs in action, Morton’s provides much more than a meal, but rather a full culinary experience. Raw Can Roll Café: Local and organic are the names of the game at this cleverly named eatery, about three miles from your Canvas Valley Forge apartment, specializing in vegetarian and vegan dishes. 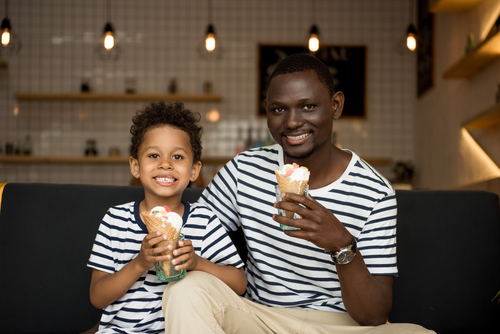 If you’re trying to get your favorite guy to eat healthier and count calories, there’s no better day to start than on Father’s Day! And with a full menu featuring generously portioned salads, handcrafted sandwiches, rice bowls and even (healthy!) desserts, he can still indulge, just without the guilt. Aroma Mediterranean Cuisine: Located about two miles from your Canvas Valley Forge apartment, Aroma is a casual BYOB spot serving authentic Greek favorites. With affordable, plentiful portions and a laidback, yet airy atmosphere, Aroma is a great spot to go with a few bottles and settle in for a relaxing dinner filled with conversation and laughter.